All orders here at Sunbasil Soap already arrive in tissue paper. But happy to offer our hand stamped fabric bag with gift tag on orders of 1-6 items. Hey Chickies! 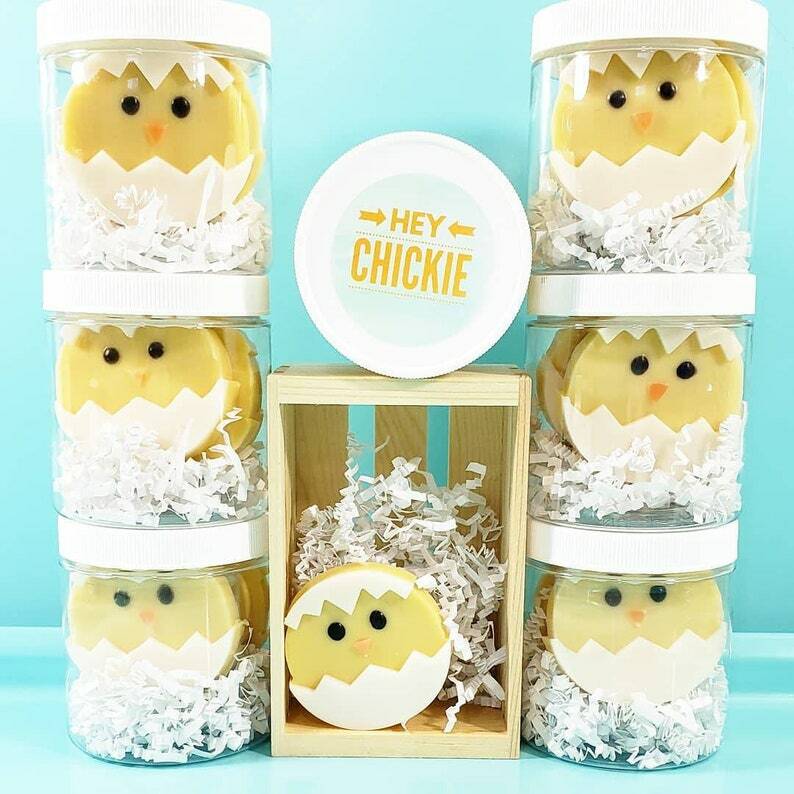 Check out this adorable jar of handmade chick soaps ready to gift to all the chicks on your list. We made this specifically to put a smile to their face. And just in time for your Easter gift giving. Each little chick is cracking from her shell and scented in one of our most favorite scents, honey bunny. A rather fitting scent for Easter and tops our all time favorite list. Delicious notes of notes of bergamot, sweet orange, and crisp apple topped in a golden honey nectar and toffee bits make this extra comforting. Each jar contains 4 handmade Chick soaps on a their very own paper nest and labelled on top with the words, "hey chickie". Each soap measures 2.25" x 2.25" x .50" Total jar weight 5.5 oz. Handmade, unique gifts are our jam! Window shop here our entire line of bath and body gift sets for everyone on your list. Making handmade bath and body since 2008 to bring you a smile and take care of your skin. With over 16,000 Etsy reviews, our customers are literally the kindest peeps on the planet! And we appreciate each and everyone of you for sharing your love of Sunbasilgarden. THANK YOU SO SOAPY MUCH!!! Kids loved these for Easter! Such cute soap and great smelling too!! All our orders arrive packaged in colorful tissue paper at no additional charge, whether as a gift or for you. Unique, handmade gift giving is our specialty. We are happy to ship your order direct to their door anytime. Just include gift recipient's address at checkout and enter note from you to them in gift card section. And we will take care of the rest! All of our products come with full list of ingredients and are individually wrapped and sealed for at least a 2 year shelf life. Soaps are packaged in clear shrink wrap so their fun designs show through. Body butters and sugar scrubs are packaged with waterproof labels so they look as pretty in the shower in use. And bath bombs are shrink wrapped so to protect from humidity too. Do you have sales and coupons? Your one way ticket to our surprise sales and new releases. Occasionally we will run sales here on Etsy but our email list is the way to go for the best sales! As much as possible, we will refund any shipping overages to your card. Please note, when purchasing larger orders, Etsy cart will often calculate a much higher shipping than our combined rate. We have for over 11 years been very firm in our policy of refunding extra shipping because no one in the world wants to pay more shipping than is necessary. Typically this is what shipping costs looks like for the following. Our wholesale shop is closed indefinitely as of 1-2018. We have expanded Sunbasil Soap to three full time websites which keeps are days and nights extra busy. Will you send me free products? We very often include free samples with every paid order. And often include free gifts for our repeat customers. We can't have you opening happy mail with out a little extra something. But we are a 100% handmade business and we can NOT provide free products for sampling, colllaborations, sponsorship of events, fundraisers, YouTube reviews, Instagram brand ambassadorship, etc. Emails of this nature will not be answered as we do not have extra staff to respond and literally receive requests daily. Thank you for considering us but serving our customers with top service and quick turnaround time is our number one focus. Sunbasil Soap no longer offers shipping internationally except to Canada. This is so important. We are sticklers for very fast shipping time. Orders will ship to the address you provide when you place your order. If you have provided an incorrect address and your order HAS NOT SHIPPED, please contact us asap and we can certainly change it. IF YOUR ORDER HAS ALREADY SHIPPED to an incorrect address, Sunbasil Soap is not responsible and will require you to pay additional shipping charges after your package has been returned to us and we re-ship to correct address. This is our only no exception to the rule policy. Not a question but a thank you! We have been selling here on Etsy since the very beginning, back in 2008 and know so many of our customers by name along with your favorite products. Whether you are visiting us for the first time or a long time Sunbasilgarden customer, we want you to to know how very much we appreciate your support of Sunbasil Soap. Thank you for making our dreams into a reality. Our hope is our handmade bath and body brings a little smile into your day.